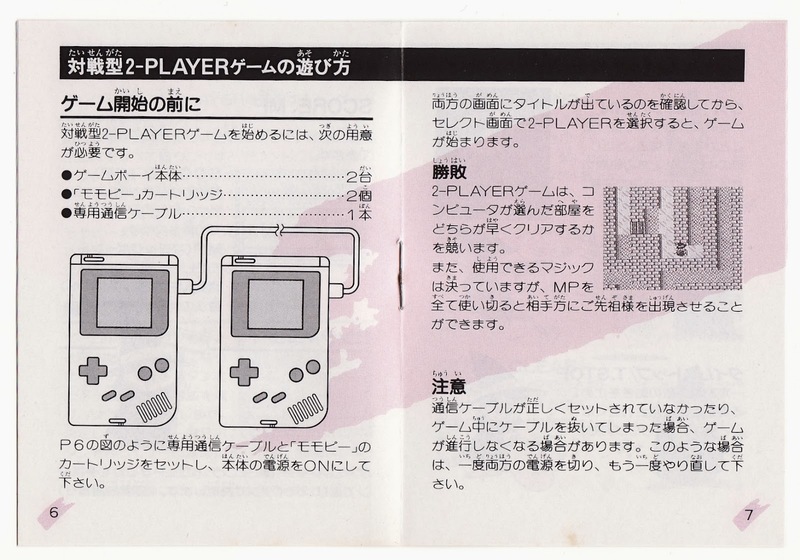 Now that I've published a review of Painter Momopie--as well as a few photos of my recently acquired copy of this import-only GameBoy title--I guess the only thing left to do is share some scans of its adorable instruction manual. Those of you who examined this game's cover art with a magnifying glass may have noticed that its character designs were created by someone named Gen Satou. Unfortunately, that name doesn't ring any bells for me, and Google has done little to clarify things, so I can only assume it meant something to the small community of Japanese folks who bought copies of this Pac-Man clone back in the day. 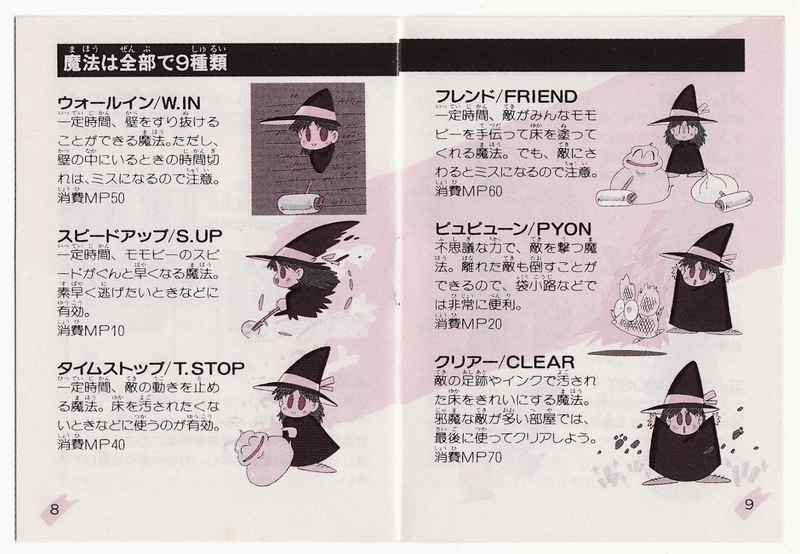 Regardless, the design he came up with for Painter Momopie's protagonist is pretty darn cute, if you ask me. 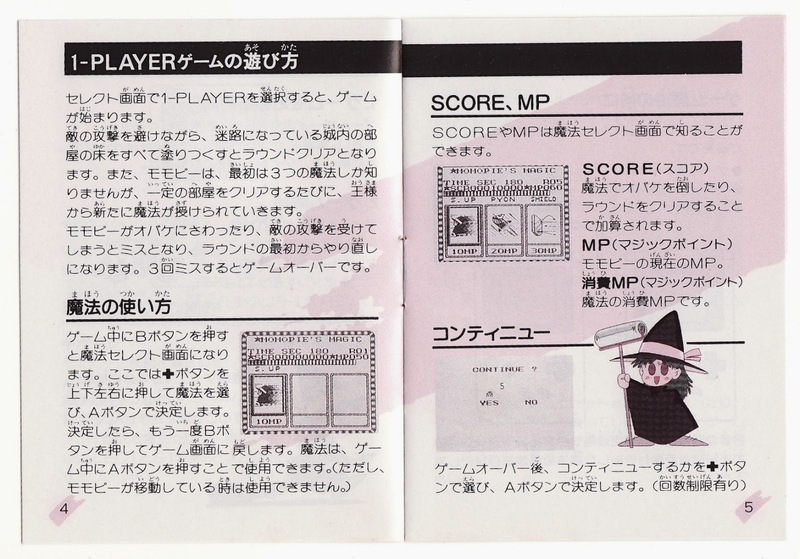 The right-hand page above shares the game's backstory, by the way. Sadly, I can't understand a word of it. 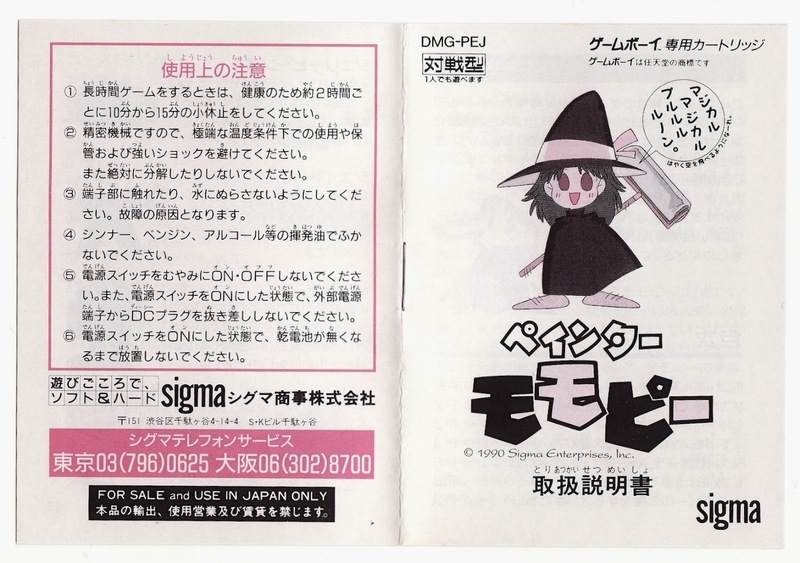 Hopefully it explains why this little witch (I mean that literally) is painting the floors of someone's home? Admittedly, these first few pages are far from exciting. 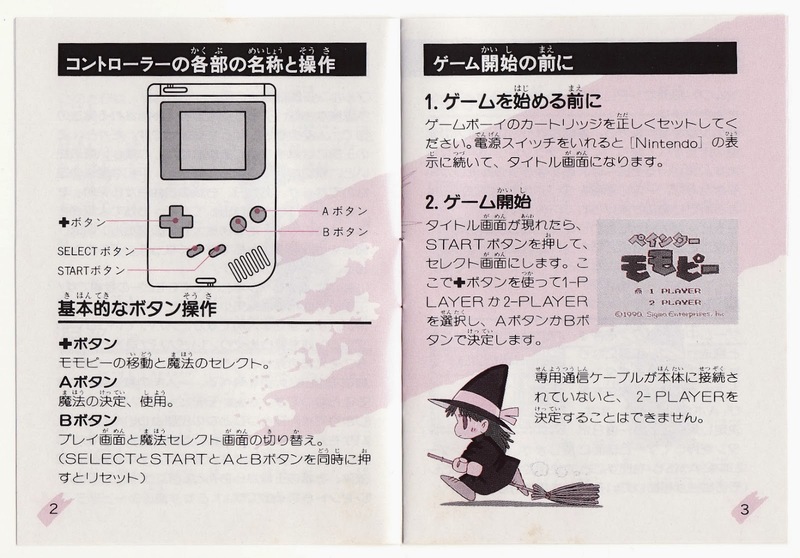 At least they feature a couple of cute illustrations, though, right? Now we're getting somewhere! 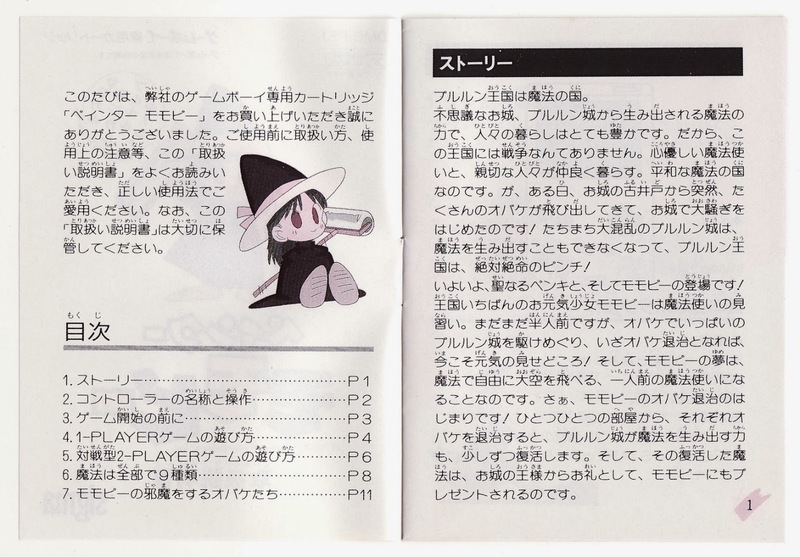 The pair of pages below show off some of the spells that are made available to the titular Momopie (at least I think that's her name) throughout the game. 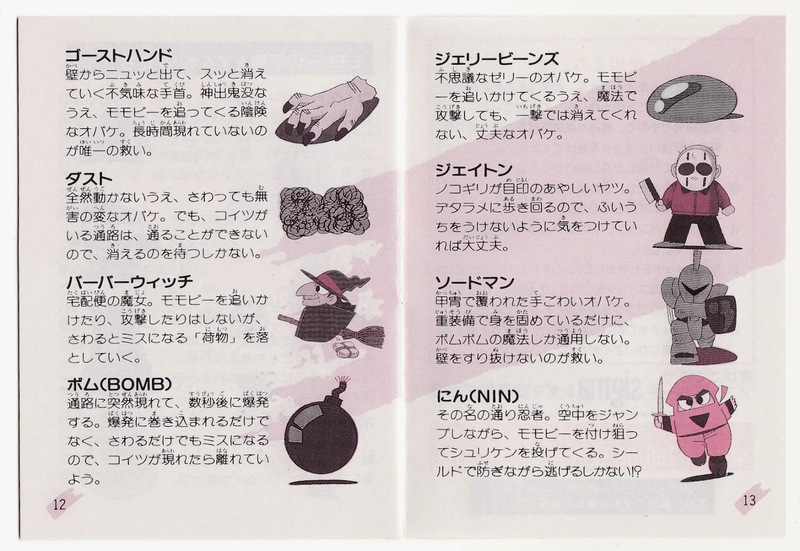 The right-hand page below highlights some of the baddies that make an appearance at one point or another in Painter Momopie. 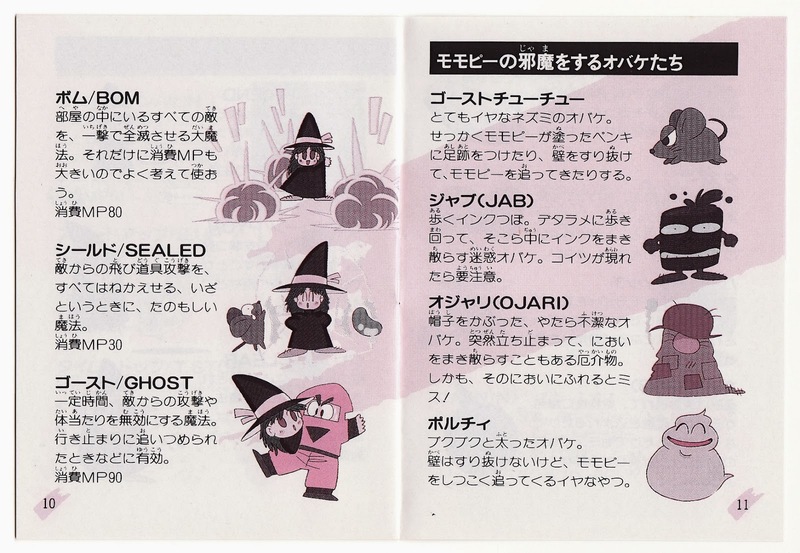 FYI: that gray lump known as "Ojari" (second from the bottom on the right-hand page above) is a stinky ghost who leaves deadly puffs of smoke in his wake. As much as I like Ojari, he isn't my favorite Painter Momopie enemy. That honor goes to the Jason Voorhees wannabe that can be seen in the scan above--although I'm also quite fond of the severed hand.